At the March 15th board meeting, South Fork Kings Groundwater Sustainability Agency (GSA) board members approved the Engineer’s Report prepared by Geosyntec Consultants. The Engineer’s Report was presented by the South Fork Kings GSA technical consultant, Amer Hussain of Geosyntec Consultants. Adoption of the Report signals Board approval for a Proposition 218 Election, a Constitutional Initiative passed by CA voters in 1996 that requires all new or increased assessments be approved by affected landowners. All landowners within the boundaries of the South Fork Kings GSA will be asked to vote on the newly proposed assessment. Its purpose is to fund the local GSA’s efforts to comply with the unfunded CA state law, the Sustainable Groundwater Management Act (SGMA). 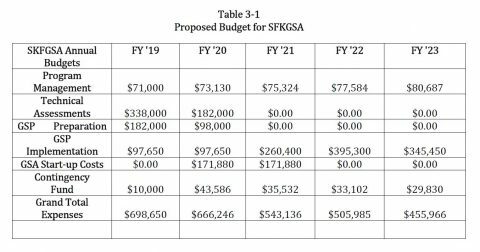 The Engineer’s Report outlines the South Fork Kings GSA’s five-year projected operating costs and expenses associated with the development and initial implementation of a Groundwater Sustainability Plan as required by SGMA, ongoing administration, technical assessments, and recovery startup costs incurred by the South Fork Kings member agencies. Click image below to enlarge. Additional components of the report include background information on the GSA, summary of GSA operations, a description of the proposed assessment, a determination of benefits derived from the assessment, and procedures to implement the assessment. Based on the model developed, the maximum annual rate proposed for assessment is $9.80 per acre for the five-year life of the proposed assessment, subject to annual review and determination by the Board. The assessment rate levied cannot exceed $9.80 without another election for voter approval. You can view the full Engineer’s Report here: Engineer’s Report. If the South Fork Kings GSA is unable to fund its efforts to comply with SGMA, the State will intervene. The Board seeks to avoid costly State Intervention and keep SGMA implementation at the local level. To find more information regarding the assessment, visit our Prop 218 page.